Be seen with a Wolo Lightning Plus Strobe light kit. This kit include 6 M-shamed strobe bulbs that are encapsulated in silicon to protect them against vibration and moisture. These Wolo strobe bulbs are equipped with a state-of-the-art microprocessor that will provide years of dependable service. Wolo Lightning Plus Strobe light kits feature a rubber grommet base on each bulb and install into a 1" hole that is drilled into the headlight, front side marker, and taillight assemblies. 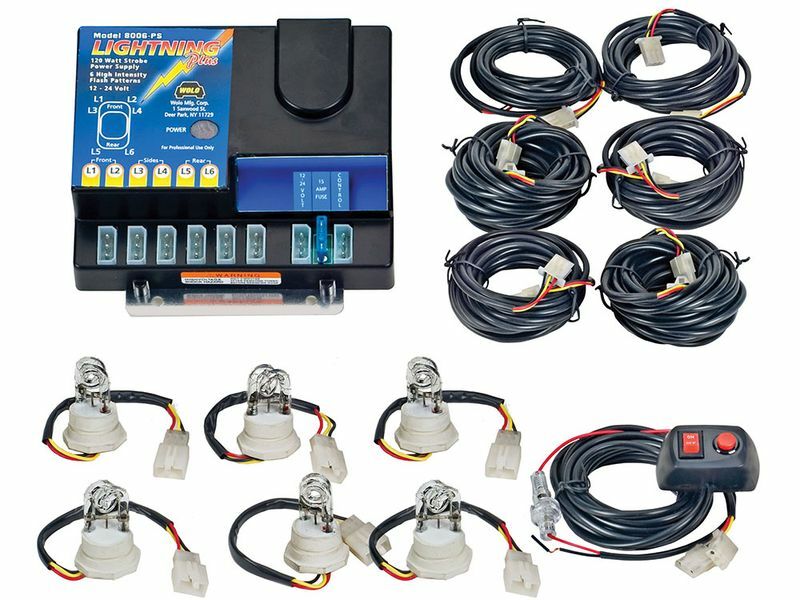 Once installed, this light kit offers 6 advanced flash patterns that are controlled with the included control panel. OF BREACH OF WARRANTY OR OTHERWISE. Easily install a Wolo Lightning Plus strobe light kit into your work or emergency vehicle. These bulbs install into a 1” hole, which is drilled into each headlight, front side marker, and taillight assembly. An aluminum mounting bracket for the power supply and all hardware is included.